Remember the bamboos that I used to make a trellis? 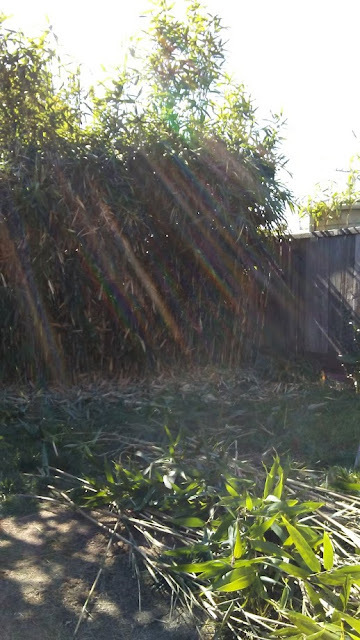 Some of us know that bamboos are extremely invasive and fast growers. I wonder if the people who planted them knew these facts about bamboos. They have grown into my surrounding neighbors' yards. 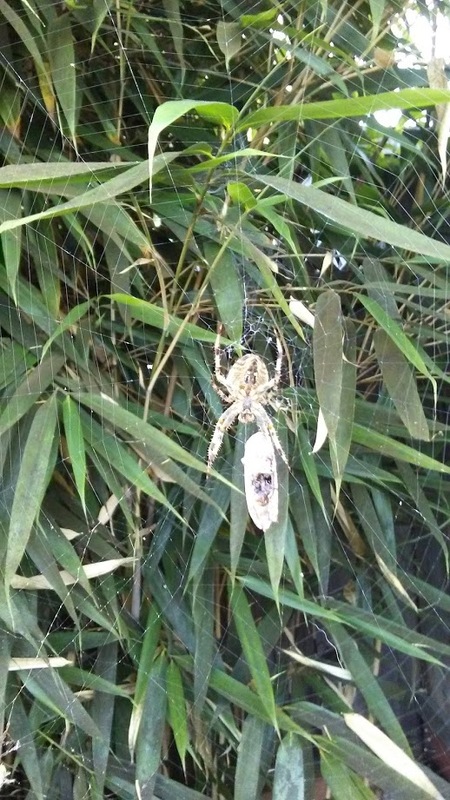 They have grown so much that I started to see big spiders and their webs on them. After doing some research, I believe these big spiders are Orb-weaving spiders, which are non-aggressive to humans and not toxic; however, they are big and scary and walking into their big webs would be terrifying. After doing more research on how to get rid of them, I decided to go the natural route - cutting down and thinning out the bamboos. Once their preferred habitats are removed, they will move on. 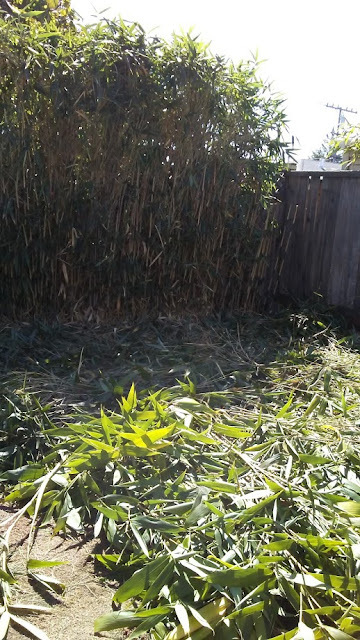 I spent the weekend sawing off the bamboos from as close to the ground as possible. I kept some of them fence height, and also cut off some super tall ones. I will be keeping some straight thick ones for more trellis. After hours of chopping, cutting, and trimming, I noticed some stinging and itchy sensations on my arms. I couldn't help not to scratch them. I was wearing garden gloves but only wearing a t-shirt and overall shorts. My ankles also experience a little itchiness. After scratching my arms a few times, I noticed little red blistery bumps all over my forearms. Upon doing more research online, I found that others have experienced the same symptoms after dealing with bamboos while some people have never experienced any problem. It's believed to be some kind of allergic reaction, which I am not surprised. My skin tends to get allergic reaction from brushing against certain plants. This is another reason to get rid of these bamboos. The dogs were running around the bamboos and stepping on the leaves. I tried to shoo them away since I don't want their little paws to get some bad reactions from the bamboos, but they don't seem to be bothered at all. I have wanted to visit Glass Beach in Fort Bragg for a few years now. I first saw a photo of Glass Beach on Instagram and was surprised that it's within driving distance from where we are. It's a little over 3 hours of drive from El Cerrito. This past weekend we took a drive up north to check it out. The weather has been unusually warm for this time of the year. However, it was also very windy at the beach. A lot of people were picking the shiny glass pebbles on the beach. I read that Glass Beach is gradually disappearing. Even though the law prohibits anything to be disturbed or removed from California State Parks, you can imagine people do take the pebbles as souvenirs. The area that's closer to the water has more glass but Cracus isn't water kind of dog, so we stayed on the dryer side. We took a walk along Ka Kahleh trail. It was beautiful and a easy walk except it was super windy to the point that your ears would hurt. We had to turn back because of the strong wind. 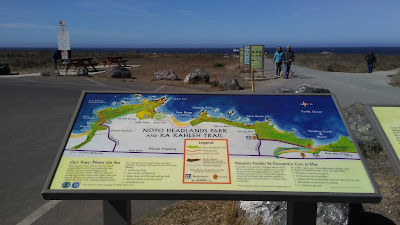 In the afternoon, we also visited MacKerricher State Park and took a walk on the boardwalk. 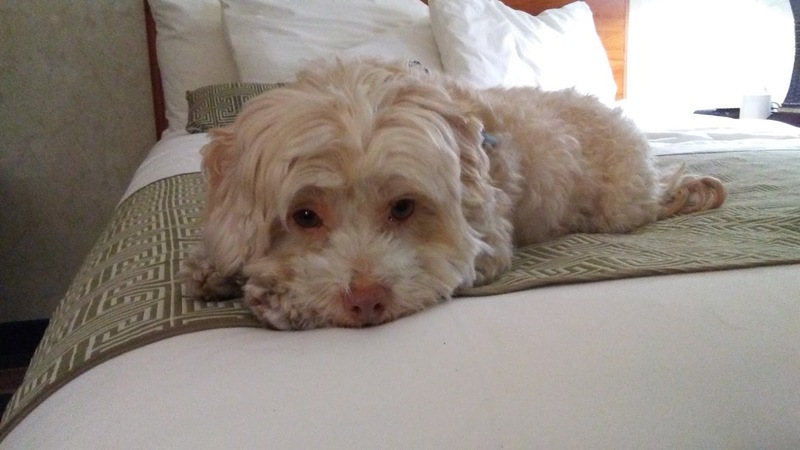 It was a lot of walking for little Cracus on one day. In the evening he just rested quietly on the bed. Shortly after he started snoring. We had great time.